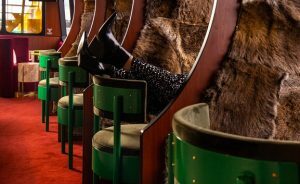 Mona Museum of Old and New Art and Mona Roma in Tasmania have unveiled a new ferry that conjures up James Bond or Austin Powers, complete with a private jungle, three bars, wallaby-fur-lined booths and a gold latrine. 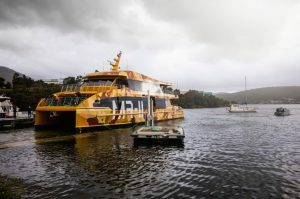 Newly launched at the Mona Brooke Ferry Terminal at Hobart’s Franklin Wharf, the exotic Mona Roma 2 (MR-II) will replace the smaller MR-0, increasing capacity and improving services for visitors to Hobart. You almost expect the International Man of Mystery to step aboard, or perhaps Dr Evil. “We are proud to launch MR-II. 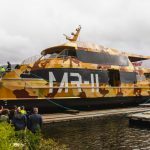 It’s a AUD 5.5 million ferry with capacity for 190, built by Richardson Devine Marine at Goodwood,” Navigators Director Michael Roche said. “It has three bars and a full galley, and we’ll be taking on five additional staff to help run it. Mona’s Director of Marketing and Communications Robbie Brammall said: “The new boat gives us a chance to try some fun new things. “For around one month in summer we’ll be trialling a ‘flexi ticket’. This flexi ticket will mean there will be no need to book a departure time, allowing more opportunity for spontaneity. “We’re also going to offer an ‘After Hours Five Buck Ferry’ which will leave Hobart at 7pm. “So you’ll be able to cruise out to dinner at Mona’s restaurants, in a catamaran in the style of an evil billionaire’s lair, for less than an overpriced soy latte. Do it, there’s even a gold toilet.” Robbie said. MR-II commences sailings this weekend.